I’ve thought about this a lot lately. It’s my new mantra, my motto — I am doing what I can, with what I have, where I am. I keep stumbling upon these words from Theodore Roosevelt…in stories, in day-to-day life, even in a book I was reading last night, Hemmingway’s The Old Man and the Sea. We all have excuses — it’s not something we’re taught, yet they roll off our tongues from a young age. Maybe it’s ingrained in us to make us feel better, to relieve that guilt, to put the pressure on someone else or something else. Too many times in our lives we’re always waiting for a better time, a better moment. Next summer when I’m not so busy, or next paycheck when I have more money, or next summer when I move to a better house. Yet, time comes and goes and we find ourselves where we started. It’s especially easy to get caught in that trap here. I don’t have the resources; I don’t have the support, so that means I simply can’t do it. All those unfinished projects, all those ideas thrown out with the garbage, all those promises and travel plans become nothing more than empty wishes. Yet, we don’t realize our capabilities, our potential. It’s taken me a year to realize it, but we think we need much more than we actually do. 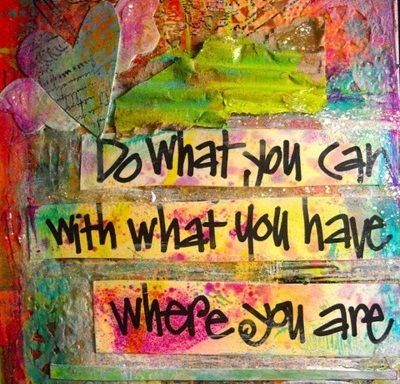 Start with what you have, where you are, and ask along the way. I’ve found starting is the difficult part — it’s downright daunting. Once you’ve started, you figure out ways to make it work — you become resourceful, creative and confident. A silly example, but an example nonetheless…cooking here is such a challenge. Simple, basic ingredients are difficult to find. So, instead of giving up on those cravings, I substitute. In the kitchen, I substitute yogurt for sour cream. I substitute honey for syrup. I substitute peanut butter for tahini sauce. No matter the goal, there is always a substitution. I am sure of it. Instead of dwelling on what I don’t have, I’ve started asking myself, “What do I have? What can I do with what I have? What can I use as a substitute?” I simply don’t want to miss out, so I figure it out along the way. If the original idea doesn’t fully develop, something will come of it, and you’ll learn along the way. Maybe even something more creative and brillant than the original…not a bad deal, if you ask me. My question for you, family and friends — what’s your mantra? You are so right, Krista. It amazes me that the more resources we have at our disposal, the more likely we make the excuses you mentioned. Maybe it is because we have so many things competing for our attention. When you have fewer resources, it forces you to make substitutions; to make do and improvise with what you have. I have seen this many times on mission trips to Belize. We often improvise and come up with a creative solution for missing material. Somehow, the job gets done. We have often remarked that “God is in the details.” He provides a missing resource, someone with a tool we need, or someone with an idea or plan that works. Take care and God Bless, Krista. It’s so easy to get overwhelmed. I like that — one person at a time. Also, time limits help so much — knowing I’m here for only two years makes it easier to begin those projects! I try to remember this poem everyday in order to stay in the present and live life to the fullest. Love it. Obstacles are life. Thank you, thank you.